How is White Chocolate Made? White chocolate has its origins in the 1930s and is a candy made from the fat or butter of cacao beans. However, it excludes the cacao components that give ordinary chocolate its characteristic flavor and appearance. It usually contains far more powdered or condensed milk and sugar than does regular chocolate, making it considerably higher in calories and affording white chocolate a creamier texture and taste. Cacao beans grow in pods attached to trees. When these beans are removed from their pods and assembled in piles, a number of chemical reactions ensue with no further intervention. These include the conversion of the sugar in the beans to glucose and fructose, some of which is further transformed into sugar alcohols, weak acids and flavorful ester compounds. At the same time, the degradation of the sprout portions of the seeds releases enzymes that convert sugars and trace proteins in their midst to yet other flavorful substances. The beans are then roasted, resulting in the cacao solids mixing with the liquefying fat portion to create chocolate liquor. When this liquor cools and solidifies, you get baking chocolate. Adding cocoa butter, sugar and milk yields the edible sort of treat with which you are almost certainly familiar. Making white chocolate means bypassing almost all of the steps in the above process. 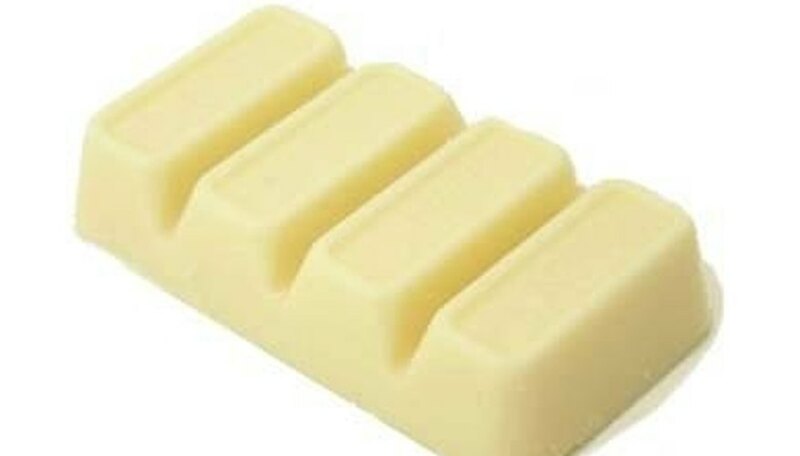 White chocolate contains cocoa butter, which itself is colorless because the brown coloration only arises during roasting, when cacao solids, which are absent from white chocolate, mix with the butter. White chocolate is made from cocoa butter blended with some combination of sugar, milk, cream and vanilla flavoring. Its light color can add panache and desirable aesthetic qualities to desserts, but too many sweet or milky additives overwhelm the lingering aroma of real chocolate carried by the butter, and in practical terms turn the confection into something besides chocolate in any meaningful sense. Experts recommend that white-chocolate-containing desserts should be served chilled, because this mitigates the sometimes extreme sweetness and fattiness of white chocolate. When placed in baked products such as muffins, white chocolate should be used in sizable chunks to preserve its flavoring properties. If melted white chocolate is desired, short bursts of time in a microwave may be preferable to melting it over hot water. According the U.S. Food and Drug Administration, products sold as white chocolate may not contain artificial coloring agents. Artificial sweeteners may be included. A variety of dairy elements are acceptable, including cream, milkfat, butter, dry whole milk, concentrated milk, evaporated milk, skim milk, buttermilk and malted milk. Certain spices, antioxidants and whey are also permissible, but nothing that imparts the flavor of brown chocolate is allowed. McGill University: What’s the Difference Between White Chocolate and Brown Chocolate? What Is the Difference Between Rennin & Rennet? Beck, Kevin. "How is White Chocolate Made?" Sciencing, https://sciencing.com/how-white-chocolate-made-4914392.html. 16 July 2018. What Are the Chemicals in Cornstarch?